As part of an ongoing effort to make content more accessible, LAM will be making select stories available to readers in Spanish. For a full list of translated articles, please click here. FROM THE APRIL 2019 ISSUE OF LANDSCAPE ARCHITECTURE MAGAZINE. Regardless of your political perspective, we can probably all agree that 2016 was an interesting year for the nation. Since then, we have seen women participating in civic action and protest in unprecedented numbers. The midterm election of 2018 resulted in a wave of firsts: a historic number of women, LGBTQ leaders, and women of color breaking onto the national scene in politics not just as candidates but as victors. Sunset Triangle Plaza in Los Angeles, by Rios Clementi Hale Studios. Photo by Jim Simmons. Welcome to spring! 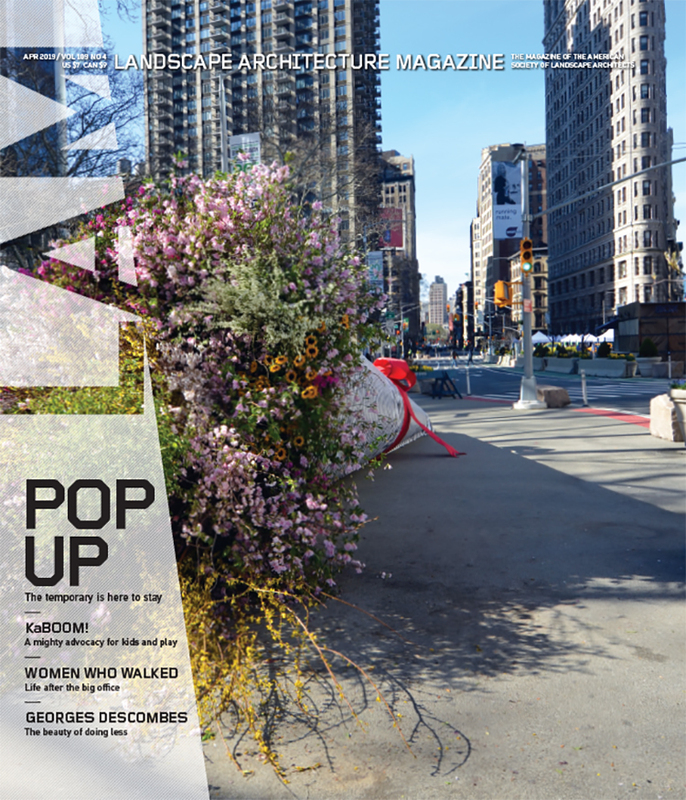 For World Landscape Architecture Month, the April issue of LAM is FREE! We’ve taken this month to go back a decade and mark the start of a movement, the Pop-Up Decade, which, who knows, could become the pop-up century. Remember 2009? Everyone was blue. There was no work—or money. But designers and their clients picked up something potent begun by the firm Rebar (now Gehl) in San Francisco with the creation of Park(ing) Day: quick, cheap, usually temporary projects to wet the public’s feet with ideas about civic spaces, try them out, see how they respond. Many of those projects went away; many more turned into something lasting. It was an idea that suited the bad old days of the early teens, but it also has continued to translate well to more prosperous times, as our feature stories show you here. In the Back is a piece every person in the profession should read, a conversation among four successful women designers on why they left powerful jobs in high-profile firms to chart their own ways ahead. It covers what is often a lot of unspoken ground—unspoken because many women don’t dare air their concerns at work, and because men in the workplace can be rather obtuse at times. Please share the issue far and wide with colleagues, clients, and friends. This setback levee project will give a river room to meander and help protect Hamilton City, California, from flooding. of the era. It’s still going strong. Some popped up and popped back down. Some stuck around or led to bigger things. An album from a decade of pop-up. The nonprofit KaBOOM! has perfected a seemingly guerrilla approach to making playgrounds where kids lack them. A conversation among the women behind the Women’s Landscape Equality (re)Solution. A review of Doing Almost Nothing: The Landscapes of Georges Descombes, by Marc Treib. A sprawling corridor park could connect Earth’s most biodiverse places. All this plus the regular Now and Goods columns. The full table of contents for April can be found here. The digital edition of the April LAM is FREE, and you can access it here and share it with your clients, colleagues, and friends. You can also buy this issue of Landscape Architecture Magazine at more than 700 bookstores, including many university stores and independents, as well as at Barnes & Noble. Single digital issues are available for only $5.25 at Zinio or you can order single copies of the print issue from ASLA. Annual subscriptions for LAM are a thrifty $59 for print and $44.25 for digital. Our subscription page has more information on subscription options. Keep an eye out here on the blog, on the LAM Facebook page, and on our Twitter feed (@landarchmag), for more updates on #WLAM and the April issue. FROM THE FEBRUARY 2019 ISSUE OF LANDSCAPE ARCHITECTURE MAGAZINE. STEM (science, technology, engineering, and math) is all the rage in academia these days. STEM degrees confer significant prestige in a high-tech world, and STEM education is funded to the tune of billions of dollars by the federal government. Privileges afforded to STEM students include eligibility for the National Science Foundation Graduate Research Fellowship Program, which excludes non-STEM students. Minority students are incented to pursue STEM degrees by grants available to those who attend historically black colleges and universities and Latinx-serving institutions. STEM is also deeply enmeshed in immigration policy. Out of concern that the flow of native-born STEM graduates falls short of labor market demand, the United States offers foreign graduate students in STEM fields an extension on their F-1 student visas to encourage them to remain in the country as high-skilled workers—a boon to the students, but also to firms that are seeking to retain top global talent in a country increasingly bent on tightening its borders. F-1 visa students in any field of study are eligible for 12 months of “optional practical training” (OPT), a form of temporary work authorization that may be used for jobs or internships related to their field. But in 2008, an additional 17 months was offered solely to students in STEM fields; in 2016, the OPT visa extension grew to 24 months, for a total of three years of work authorization. The three-year OPT visa extension is no small trinket for foreign students who are eyeing U.S. degree programs. The ability to stay in the country after graduation greatly enhances their job prospects, which in turn enhances their long-term immigration prospects: The H-1B visa that typically comes with a job in an American firm is a well-worn path to a green card and, eventually, citizenship. Because STEM figures so heavily in career choices and funding streams, professions of every stripe clamor to get in its tent. But the door is heavily guarded. Warranties on plantings often seem reasonable. Until they aren’t. Algorithms are bringing new kinds of evidence and predictive powers to the shaping of landscapes. Tree. Person. Bike. Person. Person. Tree. Anya Domlesky, ASLA, an associate at SWA in Sausalito, California, rattles off how she and the firm’s innovation lab team train a computer to recognize the flora and fauna in an urban plaza. The effort is part of the firm’s mission to apply emergent technologies to landscape architecture. In pursuing the applied use of artificial intelligence (AI) and machine learning, the research and innovation lab XL: Experiments in Landscape and Urbanism follows a small but growing number of researchers and practitioners interested in the ways the enigmatic yet ubiquitous culture of algorithms might be deployed in the field. From “The Huntress” in the February 2019 issue by Timothy A. Schuler, about Christie Green, ASLA, a landscape designer with a penchant for bow hunting and restorative ecologies. this time with more community participation. Who’s responsible when a plant fails? The U.S. government does not classify landscape architecture as a STEM topic. That is bad news for foreign students seeking visas to study here—and for the profession. that’s what the robots tell us. Hunting her meat, growing her vegetables, and designing for meaning: Christie Green, ASLA, has chosen the wild life. All this plus the regular Now and Goods columns. The full table of contents for February can be found here. Keep an eye out here on the blog, on the LAM Facebook page, and on our Twitter feed (@landarchmag), as we’ll be posting February articles as the month rolls out. Credits: “The Huntress,” Gabriella Marks; “Live and Learn,” XL Lab/SWA Group; “Changes Ferguson Can See,” SWT Design; “Life Insurance for Plants,” Cristina Cordero, ASLA, SiteWorks.